In this guide we’ll take a look at the best inflatable hot tubs for the UK market. What Is The Best Inflatable Hot Tub? Lay-Z-Spa is one of the biggest names in hot-tubs and this Lay-Z-Spa Saint Tropez Inflatable Hot Tub doesn’t disappoint. This is a great value inflatable hot tub for 4-6 people. In reality this means it will comfortably fit four people and you can fit in six if you don’t mind budging up – this is true of all hot-tubs! The Saint Tropez measures 58cms high and 196cms by 196cms and it holds 966 litres of water which is a pretty decent size and a good amount in comparison to others on the market. Look out for the ‘Lay-Z-Spa Saint Tropez Rapid Dual Operation Heating & Airjet Massage System’ which is a flash way of saying you can heat the water to a cosy 40 degrees and run its bubble-creating 87 air jets at the same time. It’s also programmable up to 72 hours in advance which is handy. No more forgetting to heat the spa because you’re busy preparing the canapés – another hot tub essential. The Saint Tropez inflatable hot tub is made with I-beam construction and ‘Tritech’. Tritech is Lay-Z-Spa’s specifically designed material that deflates and re-inflates without any loss of shape. This means you can move your hot tub around and store it without too much fuss. This inflatable tub is named after St Tropez, so of course it comes with some fun in the form of a wireless LED pool light. This floating light produces four different colours and really sets the scene during an evening. Just one niggle – don’t splash out on hot tub lighting if you only plan to use it during the day. The lights only show up after dark. It’s the best inflatable hot tub for creating a party atmosphere! A comfortable and whisper quiet four-seater for compact spaces. The Mspa Alpine Inflatable hot tub is a smaller version that will fit two people and accommodate four if you know each other well. It’s 68cms high and measures 158cms by 158cms, holds 650 litres of water and forms a sturdy square which means you can each have a corner seat and put your arms up on the wall for comfort. There are 108 air jets to get the water moving and massage your muscles, and it’s made from Rhino-tech 6 layer PVC material, which should help protect against any unwanted cat investigations or stone punctures. It also has safety buckles connecting the top lid to the ground mat. There’s a built-in control system on a large LCD screen to activate the bubbles and heater, adjust the temperature and switch on the filter system when you’re done. The screen will also show what temperature you’re currently lounging in – and speaking of temperature it’ll reach a toasty 43 degrees. If you’re energy-conscious this is a good buy because it can be programmed to save energy and reduce your running costs. One of the most common complaints about hot tubs is the noise they create. It’s not possible to relax when you have a roaring power source next to your ear, but the Alpine is whisper-quiet which is a BIG plus point. This is a classy inflatable hot tub in understated black and silver finish that will look good in any outside or indoor space. It’s one of the best inflatable hot tub models to go for on a budget. The Intex Octagonal Pure Spa is a compact inflatable hot tub with a built-in hard water system. This feature makes it the best inflatable hot tub on the market if you like minimal fuss! This inflatable hot tub combines quality build with a quirky shape for those of you that like your stuff a little more interesting. It measures 71cms high and 150 centimetres on the sides – so it’s the tallest most compact spa on my list, but it can hold 795 litres of warm bubbly water. There are 120 air jets to massage your muscles and keep that water circulating. So let’s talk controls – Intex has designed an easy-to-use control panel that lets you adjust the temperature. Not all of us like 40-degree water especially when it’s hot out, but Intex’s hot tub lets you choose from between 20 degrees up to 40 for ultimate comfort. You can also program an automatic start up and shut down, timed heating settings and deep massage options. Imagine programming that so it’s ready when you get home from work – bliss! If you’re a sensitive soul or live in a hard water area this is a good pick because it has a built-in hard water treatment system that softens the water. This means less lime-scale on the components and goodbye to dry skin. And it has a thermal ground cloth – that’s a nifty idea. I really like this one, it pushes all my buttons in terms of compactness and fiddling around to get the temperature just right. This Inflatable Whirlpool Hot Tub certainly looks the part if you’re entertaining. It has a black and white exterior with a contemporary leather trim over a tough mesh fabric to prevent accidental punctures. If you like bright and bold design this is the one for you. This inflatable hot tub measures 68cms tall and 185 by 185cms which the manufacturer says will seat four people ‘plus two’. In reality that means you can squeeze in six, but if you prefer the room to stretch out it’s best to stick with four. The spacious squared shape allows you to relax fully in the bubbly water and rest your arms on the corners. You’ll certainly be able to relax because this recommendation has the most air jets – 132 in all. That’s certainly going to give you a thorough massage as you lounge in 42-degree heat. An LCD touchscreen controls the variable-speed pump that adjusts the bubble massage intensity from a tickle to a good deep massage. This is an inflatable hot tub capable of blasting out bubbles, so if you feel other tubs don’t pack enough of a punch give this one a try. Inflatable hot tubs, or portable spas if you prefer the term, offer a touch of luxury in a ‘normal’ home. You don’t need acres of space or thousands of pounds – these are designed to fit into your lifestyle and offer deep relaxation. That said, that there are some bits to be aware of before you commit your hard-earned cash. Let’s take a look at the important stuff to make sure you know what is the best inflatable hot tub for your needs. Have a think about how many people will want to get in the hot tub at one time. If it’s just you or you’re a couple then a smaller tub is just fine. If you want friends in there too, or children will be joining you’ll need a bigger one, say a 4-6 person hot tub because it’s not relaxing if you’re all jammed in together with knees under your chin. Bigger inflatable spas are more expensive but if you can’t get everyone in it’s a waste of money because it won’t get used. You’ll also need to consider what outside space you have. The inflatable hot tub needs to sit on smooth level ground. A patio or decking is ideal, or maybe even your conservatory floor. How much of that space do you have? It’s worth measuring out the area with string so you can see what room you have to play with. A good filter system is really important as it maintains the cleanliness of your tub – no-one wants to relax in slimy green water with added feathers, dirt and flies. Your filter should be robust, easy to remove, clean and replace. Check you can easily buy replacement filters as changing them regularly will extend the life of your hot tub. To clean the filter you’ll need to switch off the whole system, remove the filter, hose it down and then dunk it in a bucket of recommended cleaning fluid. Replace it once dry. Manufacturers recommend you do this regularly such as once a week. Air jets blow air into the water to create the bubbles so lots of air jets means the water gets pretty active – but only if the pump is powerful. If you want a hot tub that can massage your tired muscles and help you relax, look for a strong pump and plenty of air jets. Some of the better inflatable hot tubs have a control panel that allows you to blow air into the water in different combinations which is great because you can personalise it to suit you. Creating the perfect mood is great fun and some hot tubs offer floating lights that change colour. These are best at night so if you don’t plan on using it after dark, don’t splash out on lights. If you’re socialising then LED lights can really make the evening as they reflect on the hot tub walling and brighten it up. What exactly is an inflatable hot tub? Simply put, it’s a heated paddling pool! 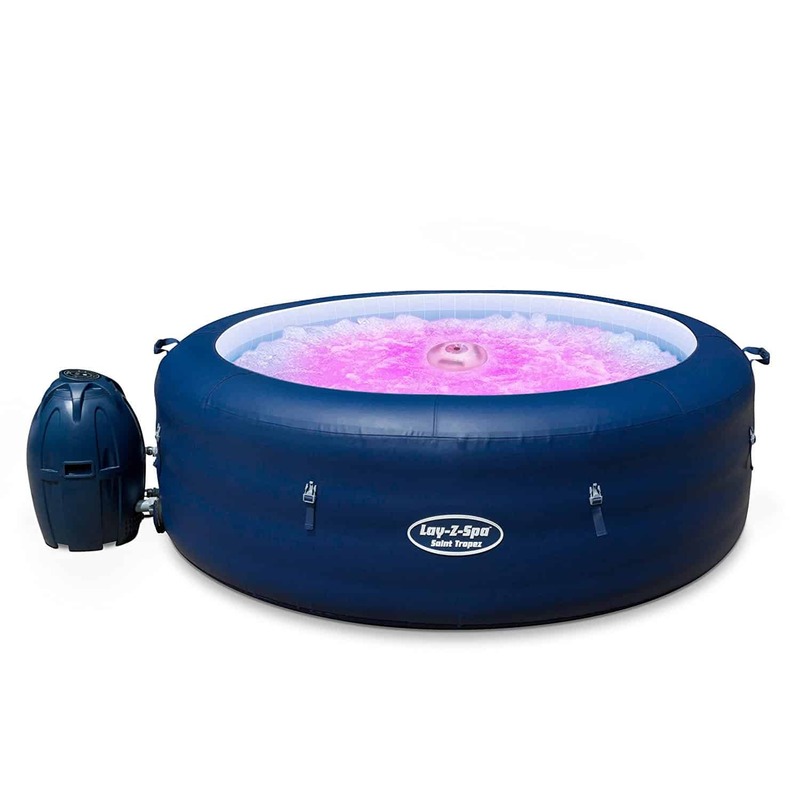 Inflatable tubs are different from standard hot tubs because they’re temporary structures. Deflating your tub and packing it away for the winter is no problem, and if you want to move it that’s OK too. In fact, you can use your inflatable tub in the house if you please. Inflatable hot tubs are also much cheaper because they require less in terms of materials and build. They’re a touch of luxury just perfect for a relaxing experience. If you have little spare space, rent your home, have a budget, or you like the convenience of packing it away then inflatable tubs are made for you. How Much To Run An Inflatable Hot Tub? Your hot tub needs electricity to heat the water. How much this will cost depends a lot on how often you’ll use it and what tariff you’re on. Lay-Z-Spa estimates the running costs reach £7-10 a week. How Long Does It Take An Inflatable Hot Tub To Heat Up? If you keep it running 24/7 then it’s always ready and you don’t have to wait, but heating it up when needed will take several hours. Manufacturers suggest that heating on demand takes 6- 12 hours depending on the outside temperature and how well insulated your tub is. A thermal ground cloth and fitted lid can make a big difference. Some individual reviews report it takes 4-6 hours to heat their 4 person tub. If you buy an inflatable hot tub with a programmer it’s possible to set the heat so it’s ready when you are. Your hot tub will come with a guide that you should follow, but in general, they are kept clean through the filer system. Filters need changing and cleaning on a regular basis and you’ll need to put chemicals in the water, just like a swimming pool, to prevent the build-up of micro-organisms. This is because you don’t fill it up every time – the water says inside the tub. Empty your tub on a regular basis following the instruction manual. Does My Inflatable Hot Tub Need A Cover? A fitted and secure lid will keep children out of harm’s way and prevent leaves, flies, dirt and feathers filling your pool. Birds will try to bathe in the hot tub given a chance and you can’t blame them. Get a bird bath! You won’t have to change the water so often if you have a lid and covering the hot tub will help keep the temperature up so it’s ready for use any time you want. What To Put Under An Inflatable Hot Tub? The bottom of a hot tub is flat without padding, so you will need to put something beneath it to ensure you are comfortable, and so that no stones or sharp objects can pierce the lining. Children’s foam playmats are a good option. Can Inflatable Hot Tubs Get A Puncture? They can but the better models are really tough, so it’s unlikely. Just be sensible – don’t place it on a rough surface and take off your high heels before getting in. If yours does get a puncture use the repair kit provided by the manufacturer or if you don’t have one a bicycle tyre repair kit. Can I Use An Inflatable Hot Tub In Winter? You can, but many of the materials won’t like low temperatures. Top manufacturers suggest packing it away when temperatures reach around four degrees as this ensures the material won’t split or rot. Frozen water can damage the pump system too, so it’s best to pack yours away or maybe set it up inside instead. If you’re thinking about choosing the best inflatable hot tub just go for it. Life is too short to sit on an uncomfortable chair or shiver in the kid’s paddling pool. Hot tubs bring a touch of glamour and luxury to our world and frankly we all need that because life can’t always be about the work, work, work, grind, grind, grind. Put an inflatable hot tub on your Christmas list this year and get ready to enjoy relaxing, warm bubbly water after a hard day – what could be better for your health than lowering your blood pressure and massaging those desk-bound muscles? I’d argue that inflatable hot tubs are medicinal and well worth an exchange for that unused gym membership fee.